U.S. Defence Secretary Jim Mattis said on Sunday North Korea will receive relief only after it takes clear and irreversible steps to end its nuclear program, adding it would be a bumpy road to a summit between U.S. and North Korean leaders. The comments sought to address concern the United States may be rushing to strike a breakthrough in the unprecedented summit between the two leaders after U.S. President Donald Trump put the meeting back on track for June 12 in Singapore. 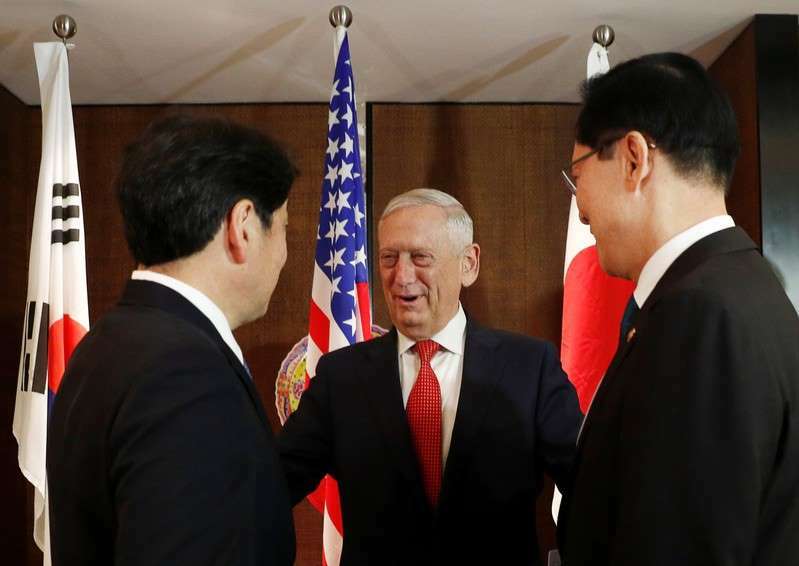 "We can anticipate, at best, a bumpy road to the (negotiations)," Mattis said before the start of a meeting with his South Korean and Japanese counterparts on the sidelines of Shangri-la dialogue in Singapore. "We will continue to implement all U.N Security Council resolutions on North Korea. North Korea will receive relief only when it demonstrates verifiable and irreversible steps to denuclearization," Mattis added. Trump said on Friday he would hold the meeting with North Korean leader Kim Jong Un on June 12 in a dramatic turn of course in the high stakes diplomacy aimed at ending Pyongyang's nuclear weapons program. Eight days after cancelling the summit citing Pyongyang's "hostility", Trump announced the decision to go ahead with the meeting after hosting Kim's envoy in the White House, saying he expected "very positive result" with North Korea. The Trump administration wants the North to "denuclearize", meaning to get rid of its nuclear arsenal, in return for relief from economic sanctions. But North Korea's leadership is believed to regard nuclear weapons as crucial to its survival and has rejected unilaterally disarming. North Korea's nuclear weapons program has been a source of major security tensions that persisted despite a series of U.N. and U.S. sanctions and it has also demonstrated advances in ballistic missile technology that experts believe now threatened the U.S. mainland.